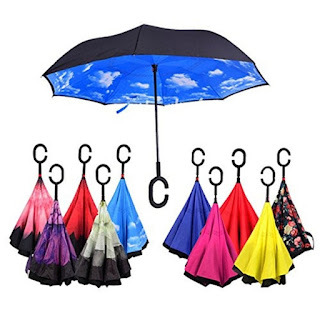 Right now this Smart Umbrella in Assorted Prints is just $15.99 (Reg. $59.99)! Shipping is FREE on this offer. If you've ever been stuck outside during a rainstorm and your umbrella was blown inside out by wind, then you understand the frustration and helpless feelings you might get. What's worse is when you get caught in the rain wearing your favorite clothing or your phone gets wet. Smart-brella is the world's first reversible umbrella! It closes inside-out, which prevents it from getting blown out and destroyed! Another reason you need Smart-brella's reversible technology is because it helps prevent a mess from happening in your home or public place. Traditional umbrellas close, and all the water drips off. Not only is this messy, but it can also create a safety hazard when the floor gets slippery. Smart-brella collects water when it closes, so you can easily dispose of it in a neat, mess-free way! You'll never get your car or your house all wet again after using the umbrella. This ultra-durable umbrella has a 55-61cm radius and an ergonomic handle for easy carrying.